The Non-Ex-Socionist: Another Book on Socionics in English! Another Book on Socionics in English! Soon I'll have to start running a list of books on socionics in English. We are at what, 4 already? I sense exponential growth... Let us hope that quality is improving along with quantity. The authors are no-names in the socionics community and have no online presence (I tried googling them in Russian and English), but that is not necessarily a damning flaw, though it is cause for suspicion. "Introverts have pale faces, often with naturally dark hair." "Extraverts... have a lighter hair color than introverts, and almost everyone I met with reddish hair is an E**J type." Obviously (I hope — to readers of this and other socionics sites), these generalizations are false. There is no correlation between the degree of contrast between facial tone and hair color and the introversion/extraversion dichotomy. I don't know where these people get such ideas. Apparently, there's something about the way socionics was originally presented by Augusta and others that has encouraged people to look for magic physiological identifiers where none exist. This is how horoscopes and superstitions maintain their popularity despite all rational argumentation against them. It is unfortunate that the author includes happenstance physical observations in dichotomy definitions. Also, the definitions are full of phrases along the lines of "some people say," "some introverts," "I think that." Definitions should be as absolute as possible and should focus on the key qualities rather than being collections of anecdotal observations and extraneous information. "The carriers (of introverted logic) are good at mathematics"
When dealing with exceptional individuals (smart, well-coordinated, or gifted in one or more ways, etc. ), all bets are off on the correlation of functional preferences to actual professional skills. Why create definitions that rule out exceptionality from the outset? If you take this route very far, it leads to pigeonholing all smart people into 2 or 3 types. As a result, intertype relations get all messed up. 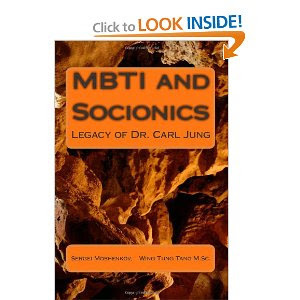 So far, I am not impressed with the style and content of the book and did not get the impression that the author is a socionics expert with a socionics awareness much higher than the average online aficionado. Some readers may think I'm being too hard on the book (which is typical of experts on a field commenting on others' writings), but this book really does appear to be amateurish and misleading. rather than being harsh, it seems to me that you are far, far too kind in actually assuming that the book has any awareness of socionics principles at all, which is not at all evident from the excerpts available. it is fair to say that this is not a book about socionics. in fact, it is fair to say that there is not any published literature in the english language that is about socionics. I guess what I don't understand is why people with so little proficiency in socionics are motivated to write books about the subject. I think you're over thinking it. They probably just noticed that there were very few English books out there on Socionics and exploited the opportunity to make money. When you think about it from that angle it's actually a pretty good idea. I mean, everyone's interested in learning about themselves and the basic "jargon" associated with socionics really isn't that hard to learn. I can understand your frustration though. As a socionist who's dedicated so much time and effort to introducing socionics to North America having *published* inaccuracies, especially when you're at the cusp of breaking through, must be pretty discouraging. I don't think that you are being too hard on the book, either. How are people supposed to take Socionics seriously when there is this book on the market that's comparable to the irrationalities of horoscopes? It's embarrassing and sheds a bad light on the Socionics community. Oh, and one more thing, 30 bucks for a 216 page paperback? That's a rip off!